The Misty Skill Runner web tool is a graphic interface for some of the skill-management actions that you would otherwise need to handle via a REST client. Access to Skill Runner is currently limited to a small group of field trial robot testers. If you&apos;d like to be a part of our Misty II Field Trial, you can apply here. To use Skill Runner to upload and run a skill, follow the steps below. Open Skill Runner and connect to Misty using your robot’s IP address. To run your skill, enter the skill’s name under “Run Skill” and click Run. Continue observing the console; as events are triggered, you’ll see debug messages in the console. Note: You can generate useable meta file content with the Generate Meta Template controls in Skill Runner. Access to the Misty skills extension is currently limited to a small group of field trial robot testers. If you are a field trial tester, you can access your extension download in the Field Trials section of the Community forums. To install the extension, use the Visual Studio Code Extensions Manager. Select Install from VSIX in the dropdown menu. On Mac OS - Press Command+Shift+P and select MistySkills. Type misty to start getting autocomplete and command information. On Windows - Press Control+Shift+P and select MistySkills. Type misty to start getting autocomplete and command information. You can use the code and examples in the API Explorer download package to help you build skills. These files contain the user interface and styles for the Misty API Explorer. This file defines the handlers for the index.html page events. Use SampleUI.js to see examples of all of the event listeners linked to the various buttons rendered in index.html. For example, Select a mood or Change LED. This file builds the server URL based on the robot you&apos;re interacting with. It provides a wider and more user-friendly range of commands than MistyAPI.js. 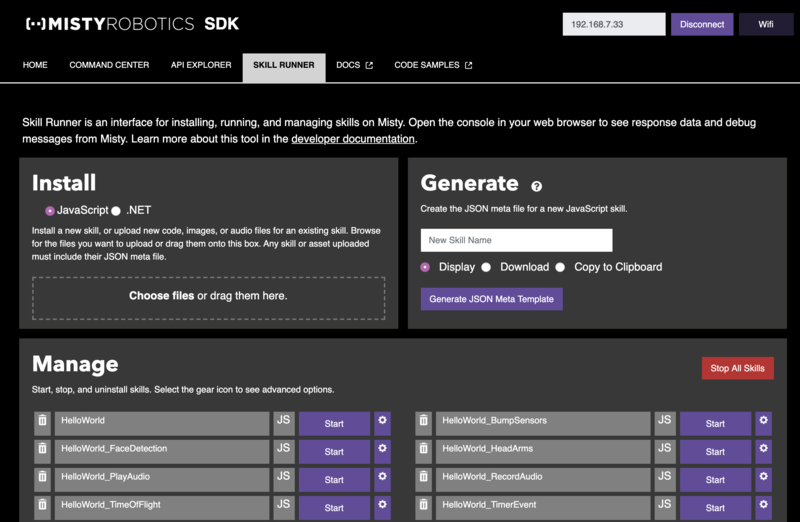 SampleUI.js calls MistyRobot.js to processes user actions by sending commands through MistyAPI.js and MistyWebSocket.js. This file is a one-to-one wrapper for most of Misty&apos;s API endpoints. It constructs payloads to pass to MistyAjax.js. You can call it directly once you have created a new MistyRobot by inputting the robot&apos;s IP address, port, and verbose level. This file allows you to subscribe to and unsubscribe from Misty&apos;s WebSockets. A simple wrapper for Ajax GET and POST requests, this file sends Ajax calls to Misty.